After a year of absence, Magnus Carlsen is back as a participant of the Grand Chess Tour. The other 11 main players are Hikaru Nakamura, Maxime Vachier-Lagrave, Fabiano Caruana, Shakhriyar Mamedyarov, Ding Liren, Levon Aronian, Wesley So, Ian Nepomniachtchi, Sergey Karjakin, Anish Giri and Viswanathan Anand. 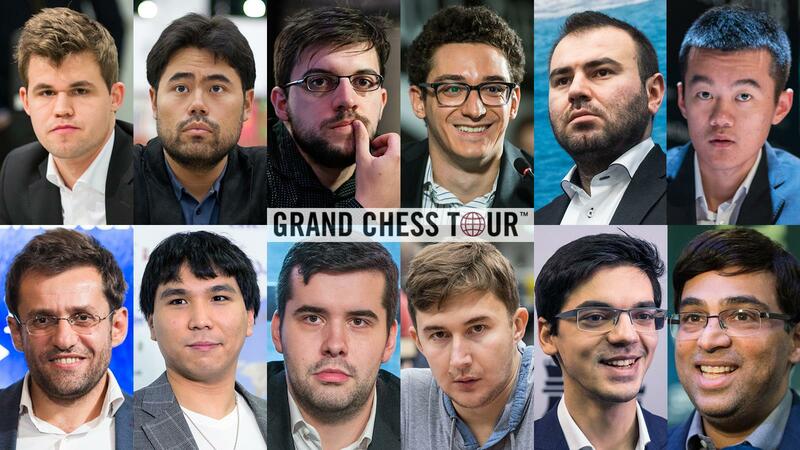 For 2019 the number of main participants in the Grand Chess Tour has been increased from nine to 12, and on Thursday the names were announced. As it turns out, Vladimir Kramnik, who recently announced his retirement, is the only player to have declined his invitation and another Russian grandmaster, Karjakin, stepped up in his place. *URS=The Grand Chess Tour’s Universal Rating System. “We’re hoping that Vlad [Kramnik] will participate in one of the rapid and blitz [events] as a wildcard,” said GCT spokesperson Michael Khodarkovsky, who indicated that Paris would be a likely tournament for that. All participants have to play both classical events (Zagreb and St. Louis), and three out of five rapid and blitz events. This means there are 14 wild cards to give away and for that, the organizers will go down their (universal) rating list starting with the name below Karjakin. Young guns such as Jan-Krzysztof Duda, Vladislav Artemiev and Daniil Dubov will definitely be invited, said Khodarkovsky. Michael Khodarkovsky interviewed by Maurice Ashley on Thursday in St. Louis. Two weeks ago the organizers announced that the fifth edition of the Tour will see more tournaments (eight in total, including the finals in London) and more participants (12 regulars, and 14 wild cards). Last year’s $1,050,000 USD prize fund has been increased to $1,750,000 USD. Ivory Coast Rapid & Blitz, May 6-13, 2019. Abidjan, Ivory Coast. Croatia GCT (Classical), June 24-July 9, 2019. Zagreb, Croatia. Paris Rapid & Blitz, July 26-August 2, 2019. Paris, France. St. Louis Rapid & Blitz, August 8-15, 2019. St. Louis, U.S.
Sinquefield Cup (Classical), August 15-30, 2019. St. Louis, U.S.
Superbet Rapid & Blitz, November 4-11, 2019. Bucharest, Romania. Tata Steel Rapid & Blitz, November 20-27, 2019. Kolkata, India. GCT Finals (four players qualify), November 30-December 10, 2019. London, UK. All these events can also be found in Chess.com’s tournament calendar.